Historically, departure procedures were built around existing ground-based technology and were typically designed to accommodate lower traffic volumes. Often, departure and arrival routes use the same NAVAIDs creating interdependent, capacity diminishing routes. RNAV is a method of navigation that permits aircraft operation on any desired flight path within the coverage of ground- or spaced- based NAVAIDs or within the limits of the capability of self-contained aids or a combination of these. In the future, there will be an increased dependence on the use of RNAV in lieu of routes defined by ground-based NAVAIDs. As a part of the evolving RNAV structure, the FAA has developed departure procedures for pilots flying aircraft equipped with some type of RNAV technology. RNAV allows for the creation of new departure routes that are independent of present fixes and NAVAIDs. RNAV routing is part of the National Airspace Redesign (NAR) and is expected to reduce complexity and increase efficiency of terminal airspace. When new RNAV departure procedures are designed, they will require minimal vectoring and communications between pilots and ATC. Usually, each departure procedure includes position, time, and altitude, which increase the ability to predict what the pilot will actually do. RNAV departure procedures have the ability to increase the capacity of terminal airspace by increasing on-time departures, airspace utilization, and improved predictability. RNAV 1 procedures require that the aircraft’s total system error remain bounded by ±1 NM for 95 percent of the total flight time. RNAV 2 requires a total system error of not more than 2 NM for 95 percent of the total flight time. If unable to comply with the requirements of an RNAV or RNP procedure, pilots need to advise ATC as soon as possible. 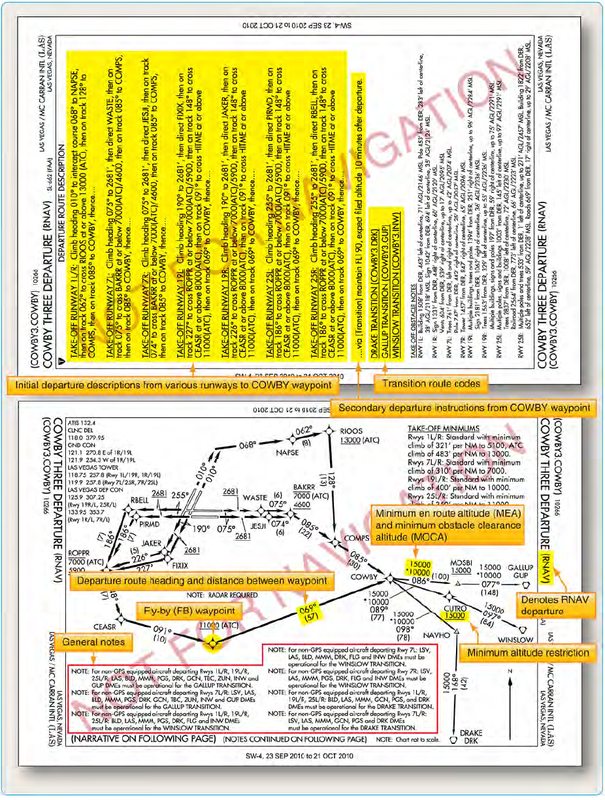 For example, “N1234, failure of GPS system, unable RNAV, request amended clearance.” Pilots are not authorized to fly a published RNAV or RNP procedure unless it is retrievable by the procedure name from the navigation database and conforms to the charted procedure. 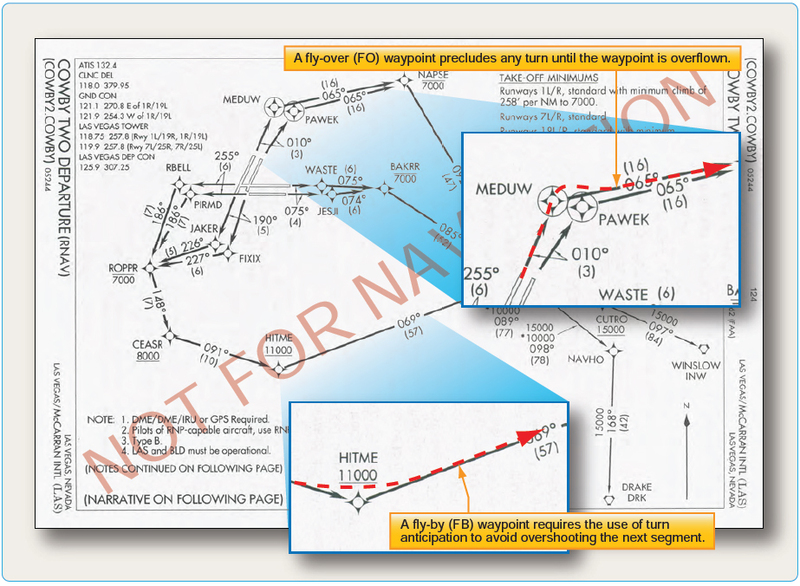 No other modification of database waypoints or creation of user- defined waypoints on published RNAV or RNP procedures is permitted, except to change altitude and/or airspeed waypoint constraints to comply with an ATC clearance/ instruction, or to insert a waypoint along the published route to assist in complying with an ATC instruction. For example, “Climb via the WILIT departure except cross 30 north of CHUCK at/ or above FL 210.” This is limited only to systems that allow along track waypoint construction. 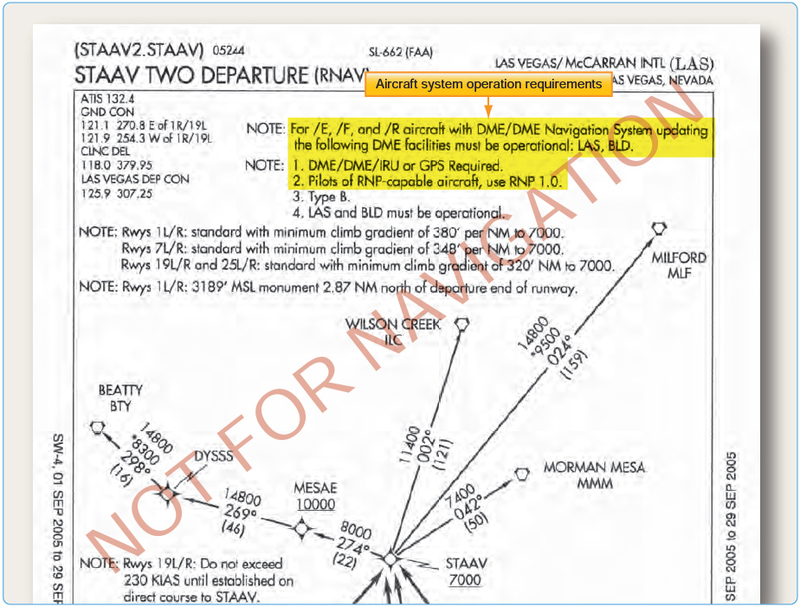 Pilots of aircraft utilizing DME/DME for primary navigation updating should ensure any required DME stations are in service as determined by NOTAM, ATIS, or ATC advisory. DME/DME navigation system updating may require specific DME facilities to meet performance standards. Based on DME availability evaluations at the time of publication, current DME coverage is not sufficient to support DME/DME RNAV operations everywhere without IRU augmentation or use of GPS. 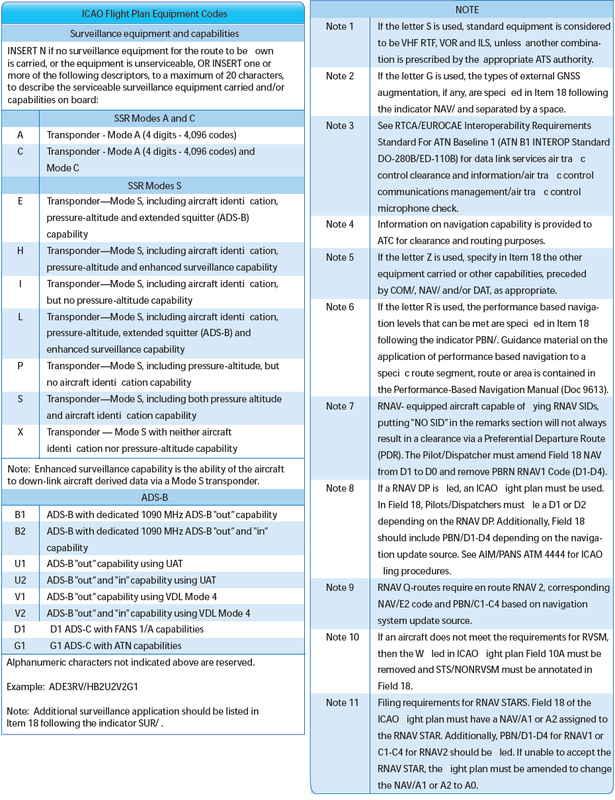 [Figure 1-28] DP chart notes may also include operational information for certain types of equipment, systems, and performance requirements, in addition to the type of RNAV departure procedure. While operating on RNAV segments, pilots are encouraged to use the flight director in lateral navigation mode. RNAV terminal procedures may be amended by ATC issuing radar vectors and/or clearances direct to a waypoint. Pilots should avoid premature manual deletion of waypoints from their active “legs” page to allow for rejoining procedures. While operating on RNAV segments, pilots operating /R aircraft should adhere to any flight manual limitation or operating procedure required to maintain the RNP value specified for the procedure. 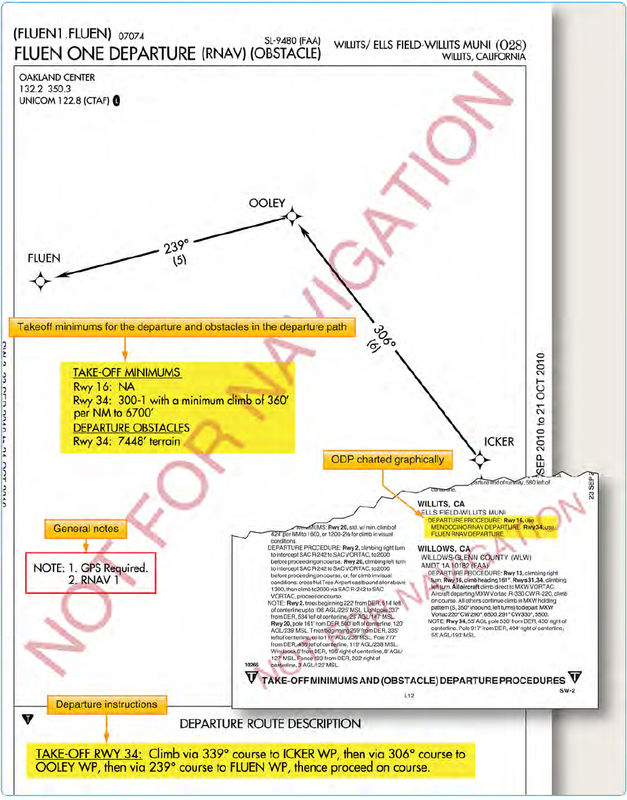 In 2008, the FAA implemented the use of en route host automation ICAO flight plan (FP) processing for requesting assignment of RNAV SID, Standard Terminal Arrivals (STARs), or RNAV routes U.S. domestic airspace. This is part of a risk reduction strategy for introduction of the En Route Automation Modernization (ERAM) system in October 2008. 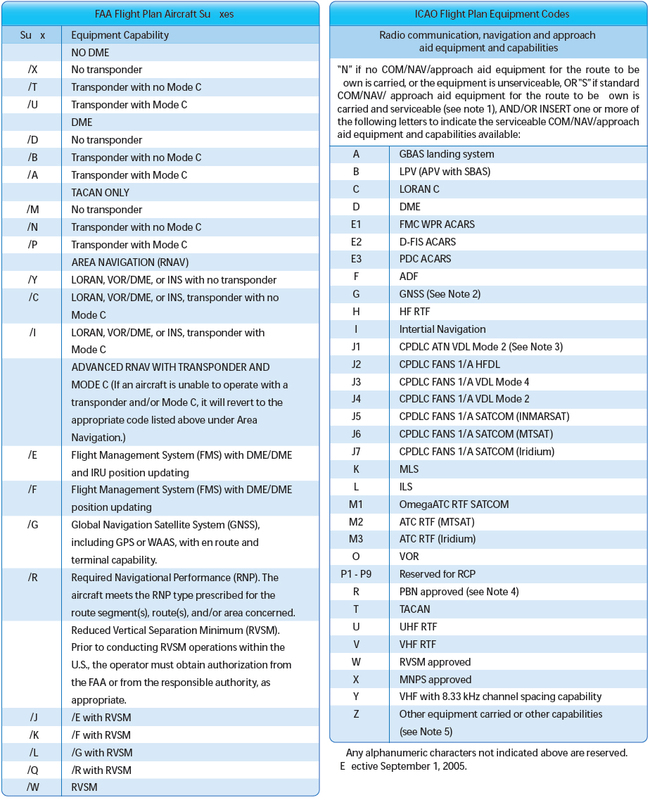 ERAM also will use ICAO FP processing and as a result aircrews should be aware that as the FAA updates to ERAM the standard FAA flight plan equipment suffix codes will change to the ICAO flight plan equipment suffix codes. Additionally, new waypoint symbols are used in conjunction with RNAV charts. There are two types of waypoints currently in use: fly-by (FB) and fly-over (FO). A FB waypoint typically is used in a position at which a change in the course of procedure occurs. Charts represent them with fourpointed stars. This type of waypoint is designed to allow you to anticipate and begin your turn prior to reaching the waypoint, thus providing smoother transitions. Conversely, RNAV charts show a FO waypoint as a four-pointed star enclosed in a circle. This type of waypoint is used to denote a missed approach point, a missed approach holding point, or other specific points in space that must be flown over. [Figure 1-31] Pilots should not change any database waypoint type from a FB to FO, or vice versa.